We’re excited to share more details about The Durham 150 Opening Celebration Presented by Aetna, planned for Saturday, April 13 from 10:00 a.m.-2:00 p.m. at the American Tobacco Campus (ATC). Mayor Steve Schewel will lead off the official recognition and fanfare, inviting everyone to enjoy complimentary birthday cake and what makes Durham such a dynamic community. The Opening Celebration will highlight the four themes of Durham 150 (history and education, innovation and entrepreneurship, social equity and robust democracy, as well as arts and leisure) as everyone will be encouraged to visit themed ‘neighborhoods’ throughout ATC. Each neighborhood will feature local experts, artists, and community leaders hosting exhibits, crafts, mini-classes and demonstrations. There will be live entertainment throughout the Opening Celebration on the main stage with The African American Dance Ensemble, Bouncing Bulldogs, Kidznotes, storyteller Willa Briagm, and others performing. Stop by and add your picture to a photo mosaic mural, record and add your story to Durham’s historical archives at a story kiosk, and be one of the first to claim a floatable rubber ducky (made in the likeness of a bull), to participate in our very own “Running of the Bulls” down the river at ATC. The event is free and open to the public. Bring friends and the whole family for a fun-filled, engaging experience. Whether you’re among the proudest, most knowledgeable Durhamites or new to the Triangle area, we’re excited to share the day with you. We know that you will walk away having learned something new while gaining appreciation for this place we call home. Did you know that we have a grant program to assist individuals and organizations planning events or projects that align with one of the four themes and the mission of Durham 150? Grant applications are accepted on a rolling deadline on 15th of every month between February and July 2019. From the applications submitted before the February deadline, there were a total of 26 grants awarded ranging from $250 to $2,000. More information about the awarded projects and the grant program is included in this press release. The grant program is sponsored by the A.J. Fletcher Foundation, Rotary Clubs of Durham and Wexford Science + Technology. We look forward to seeing these projects come to fruition, helping to celebrate Durham’s diverse community, rich history, and promising future. 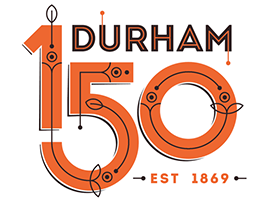 You hopefully know by now that this year marks the 150th anniversary of the incorporation of the City of Durham. What you might not know is that the City of Durham was the first and biggest sponsor of Durham 150, contributing funds needed to get the yearlong commemoration up off the ground and running. Durham County also immediately jumped in, stepping up as Durham 150’s Bartlett Durham sponsor and contributing funds needed to achieve our mission and vision. As noted in the name of the Durham 150 Opening Celebration Presented by Aetna, we’re pleased to have Aetna on board as the official birthday party’s naming sponsor. Aetna will have an exhibit at the event to promote healthy lifestyles at the American Tobacco Campus. We are excited there are several other sponsors on board for key Durham 150 events and activations, and we look forward to introducing them in coming issues of this newsletter. For everyone’s continued support, we thank you. It was so very thrilling to see the outpouring of support and interest surrounding ticket sales for "The Best of Enemies" Durham Special Screening at The Carolina Theatre of Durham occurring on March 19. The tickets were sold out in 30 minutes! Durham 150 collaborated with "The Best of Enemies" Premiere Committee with the generous support of The Forest at Duke, who helped sponsor the VIP reception and expenses associated with a special Durham Public School screening of the film earlier in the day. The special screening is a signature event of Durham 150 and will spur important conversations surrounding our history and education and social equity and robust democracy themes as Durham’s civil rights history is brought to national attention. There will also be a screening and panel discussion at Duke on March 20 (also sold out), before the film premieres nationwide on April 5. March 28 — 5:30-6:30 p.m.
M-F 10 a.m.-5 p.m., Sat 10 a.m.-3 p.m. Premiere: "The Best of Enemies"
Moving forward, we’re planning to share with you a historical tidbit or story from Durham’s past. As we enter March Madness, we thought this newsletter would be a great time to recognize “The Secret Game.” This year marks the 75th anniversary of the first interracial basketball game in the Jim Crow South, played between NC Central and Duke University. The Secret Game was pivotal to the evolution of basketball and civil rights, inspiring Scott Ellsworth to author the nonfiction book “The Secret Game: A Wartime Story of Courage, Change, and Basketball’s Lost Triumph” and national praise for sparking large scale social change. Your involvement is needed to help plan and execute a dynamic, yearlong observance that includes everything from a community-wide family reunion and series of events, to celebrations of our roots and all that lies ahead.